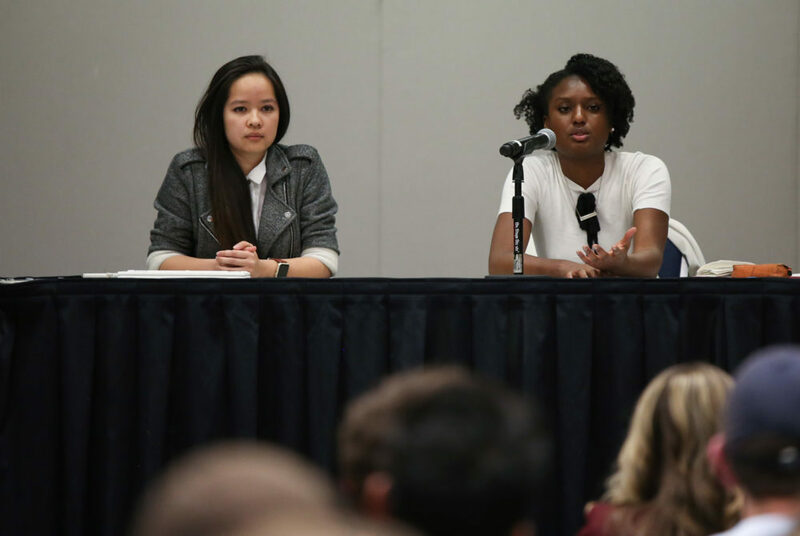 Presidential candidates Ashley Le and Imani Ross fielded questions about diversity and inclusion on their platforms at the annual SA debate Tuesday. After a racist social media post made national headlines last month, all four candidates vying for top spots on the Student Association have made diversity and inclusion a top priority. SA candidates vowed to ensure students from different backgrounds are included in diversity discussions with administrators as they implement new initiatives to improve campus life for students of color. Although this is not the first time the topic has been front and center during election season, this year three top contenders have included some sort of diversity task force or council in their platforms, and all four said they would amplify minority voices in their tenure. In this year’s diverse pool of candidates for SA president and executive vice president, every candidate elected would come from a group that hasn’t been represented in SA leadership in recent history. Junior Ashley Le, who grew up in Vietnam, would be the first female Asian SA president in at least a decade, and junior Imani Ross would be the first black woman ever to serve in the role. Doctoral student Brady Forrest, who is also queer, would be the first graduate student to serve as executive vice president in recent history and sophomore Ojani Walthrust would be the first black student in recent years to hold that position. “It’s very hopeful to see students of color, especially in the past few years, or just marginalized students, come forward and really lead the way and make huge strides for the Student Association and for the student body,” Annabel LaBrecque, the co-president of GW Students for Indigenous and Native American Rights, said. Candidates said diversity councils are needed after the offensive social media post, which depicted members of the sorority Alpha Phi, highlighted already-existing racist sentiments on campus. Le’s platform creates a collaborative body – including students who are racial minorities, members of the LGBTQ community and first-generation students, among other underrepresented groups – that would host monthly town halls to hear from students about the challenges they face. “Moving forward it is our responsibility and it is up to us and it is our goal to implement diversity in whatever project we do,” she said. Ross’ platform includes a diversity and inclusion council comprised of student organization leaders who would represent different minority communities. She also wants to implement a cultural competency course requirement, mandating that all students take one class on historically underrepresented or oppressed groups before graduation. Ross, the chairwoman of the SA Senate’s student life committee, introduced a resolution to remove Alpha Phi from campus and demand a slew of other steps by the University to address concerns about racism. Executive vice presidential candidates Walthrust and Forrest co-sponsored the resolution as senators. In his three-year tenure on the SA, Forrest said similar incidents have occurred over the years and the Snapchat post only added to an “unfortunate” campus trend. In 2016, the SA finance committee’s failure to fund the South Asian Heritage Celebration keynote speaker sparked a wave of interest in the SA by multicultural student organizations, which resulted in one of the most diverse senates in recent memory. Walthrust, who said the Alpha Phi incident inspired his campaign for executive vice president, proposed creating an academic resource center for students of color in the Multicultural Student Services Center. Racist incidents have been a recurring issue at GW, but he said most students either don’t know about them or don’t pay attention. Several of the candidate’s platform points are a continuation of the current SA administration’s initiatives to address diversity and inclusion within the SA and the student body. SA President Peak Sen Chua and Executive Vice President Sydney Nelson said they have filled senate and cabinet seats with qualified students from a range of backgrounds, races and sexual orientations. “The more diversity we bring into the Student Association, the more ideas we will have and the fresher and more powerful our perspective on students and student life will be,” Chua said. Nelson said this year, the University is on board to tackle the issue alongside SA leaders – giving students a prime opportunity to “genuinely and authentically” help implement changes. Administrators announced in February that all incoming students will be required to go through diversity training beginning next academic year. Officials also asked students at a town hall about racism to apply to participate in a “diversity and inclusion project team,” where students will work to implement many of the nine measures officials announced in the wake of the Snapchat incident. “We just need SA candidates who are ready to be partners in that and really move the needle forward,” Nelson said. Leaders of multicultural student organizations said they hope next year’s SA will include more students of color and promote ideas from multicultural organizations. Tomi Sodimu, the president of the African Student Association, which hosted a diversity town hall last Monday for candidates to discuss their platforms, said she expects incoming SA leaders to “actually communicate with the multicultural community and get their input as they move forward.” She said SA leadership should hold itself and officials accountable for commitments that have made to the multicultural community. “Affecting real change on this campus requires the engagement and participation of everyone at all levels, hence being knowledgeable about who we are picking to represent us in student government is crucial to our success,” Sodimu said in an email.